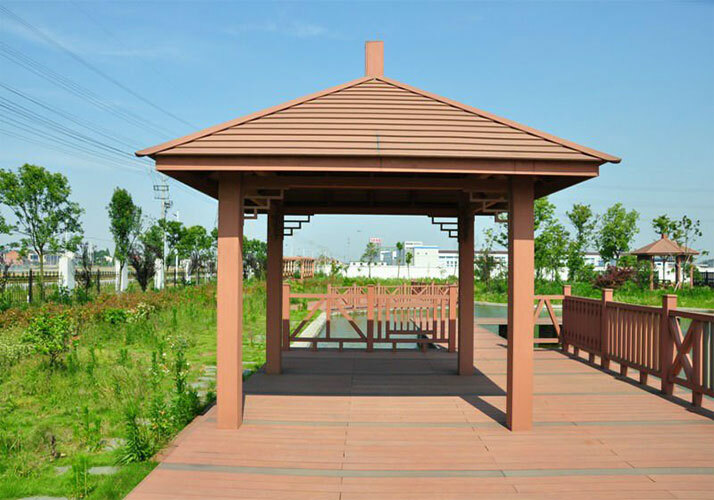 Wood plastic composite (WPC) is one of very popular pavilion materials in recently years, because is made up of wood and plastic, therefore ecological wood plastic composite pavilion both advantages of wood also has the advantage of plastic. WPC extrusion process finished by the look and feel exactly like wood, but also has the processing performance and workability of wood, compared with production of wood and wpc pavilion, WPC has better water resistance , anti-corrosion and other functions, it does not appear like the wood itself has some defects, such as warping, knots and fade etc., after many years of use, such as wooden pavilion attack by termites and other pests, they will affected product beauty and life but wpc can resistance pests, WPC products do not only beautiful but also long life, as well as wood-plastic composite products can be flexible design, have strong decorative structure. WPC pavilion adhering environmental protection, low-carbon design concept, get rid of environmental pollution type of raw materials, reduce carbon dioxide emissions and pollution of the environment, in line with international environmental protection standards. WPC pavilion uses a high-density sheet molding technology, while a new type of fiber material is uniformly penetrate pavilion factor, making wpc pavilion with high stability, easy to solve the wpc product shrinkage wet up, warped deformation problem;on the other hand, the degree of reduction of wood fiber molecule active, so that harmful substances with the outside world inside the isolation plate, Ecological material properties of ultra-stable floor, no crack, no deformation, but also can environmentally friendly. If you want to buy ecological wood plastic composite pavilion , please contact us, looking forward cooperation with you.